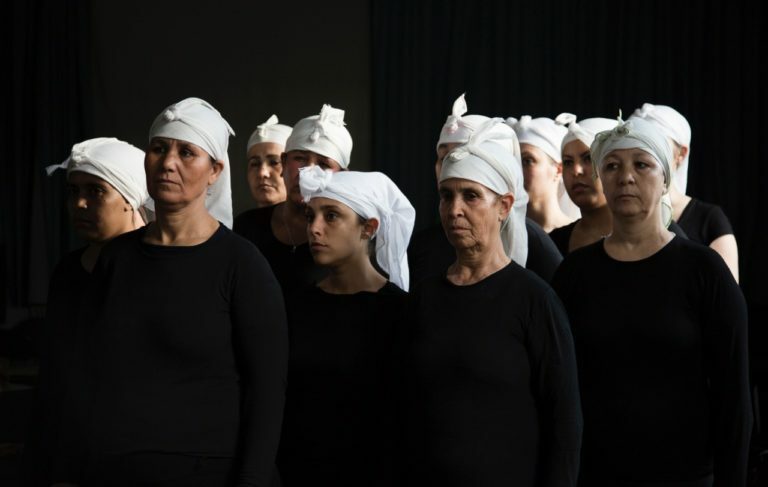 We’re delighted to announce that we’re supporting the UK premiere of Bouchra Ouizguen’s Corbeaux, part of Shubbak, London’s largest biennial festival of contemporary Arab culture. The festival offers an innovative and diverse programme across the fields of music, performance, visual arts, literature and film in the capital now until Sunday 16 July. We’re excited to be part of the festival for the first time! There are some fantastic events still to come as part of Shubbak. Next weekend, experience two days of inspirational Arab Literature at the British Library with panel discussions, readings, interviews and workshops. As part of the event, celebrated British poet and multi-disciplinary artist Malika Booker comes together with four mesmerising Arabic poets, Dunya Mikhail, Golan Haji, Mona Kareem and Al-Saddiq Al-Raddi for bilingual performances of their work in Keepers of the Flame next Saturday evening. Catch some exciting performances including Mind, the Gap and For the Absent Ones (11 and 12 July, 8pm, Arcola Theatre). The first is a lecture performance on how we perceive and consume images in our current age and the latter is a response to tightening borders and restrictions on travel. This Friday evening, enjoy some jazz with Beirut born Tarek Yamani and his trio featuring Yazz Ahmed. The festival’s film programme in partnership with the Barbican, offers a wonderful selection of films from shorts to documentaries and fiction which explore identity, borders, reflections on cultural history and imagined realities and futures. This Saturday the festival presents the Radical and playful Bloody Beans which follows a group of children ‘playing’ war by reenacting Algeria’s War of Independence. Sunday afternoon see Shorts from Syria – a series of short films that have pushed and tested the boundaries of what can be said in an authoritarian regime. Also this Sunday is the UK premiere of Tramontane by Lebanese director Vatche Boulghourjian. Premiering at Cannes Film Festival in 2016, which details a young blind musician who goes on a journey of discovery through Lebanon’s villages, searching for answers to his identity. Catch the exhibition – Animated Images by Syrian artist Sulafa Hijazi, which is a response to our changing relationship with new media, at Rich Mix from 6 – 29 July. Also the thought-provoking Shift exhibition at The Mosaic Rooms (until 2 September) is a must-see! The UK debut group exhibition brings three young female artists from Saudi Arabia: Zahrah Al-Ghamdi, Dana Awartani and Reem Al-Nasser. The works reflect the artists experiences of living in their home cities and domestic spaces.